TiE Entrepreneurial Summit (TES) 2008, was a platform for over 135 expert speakers across 43 sessions, 13 stellar plenary sessions, 22 high powered panel discussions and 8 supremely inspiring ‘My Story’ sessions. The summit was complemented by over 400 entrepreneurs getting the right insight and direction into their plans in over 70 hours of exclusive one on one mentoring through the gurus of entrepreneurship and exclusive networking opportunities. It was a great opportunity for three MET management students Kartik Mantha, Karan Doshi and Rohan Mehra to participate at this summit. “It was the most memorable moment of my life when Mr. Nandan M. Nilekani, Co-Chairman of the Board of Directors – Infosys, autographed and presented me his newly authored book” said Kartik who was overwhelmed with the presence of great industry icons. Mr. Azim Premji, Chairman – Wipro, Prof. C. K. Prahalad, Management Consultant, Author, Professor of Corporate Strategy, Dr. Vijay Mallya, Chairman - United Breweries Group and Kingfisher, Capt. G.R. Gopinath, Managing Director - Air Deccan, Dr. Carl J. Schramm, CEO - Ewing Marion Kauffman Foundation and also known as ‘Evangelist of Entrepreneurship’, Mr. Som Mittal, Chairman - NASSCOM, Mr. S. Gopalakrishnan, Founder & CEO – Infosys, Dr. R. K. Pachauri, Board of Directors - Indian Oil Corporation Ltd., Ms. Kiran Mazumdar Shaw, Chairperson and Managing Director - Biocon Ltd. and other iconic entrepreneurs shared their professional insights. Karan Doshi said, “Getting to know their experiences was truly inspirational and motivational”. The theme for TES 2008 was ‘Inclusive Entrepreneurship’. The summit was broad based to include non – IT sectors such as Healthcare, Media & Entertainment, Manufacturing, Real Estate, Retail, Social Entrepreneurship and Clean Tech which are propelling the growth of new India. Saving energy was another major feature of this summit. 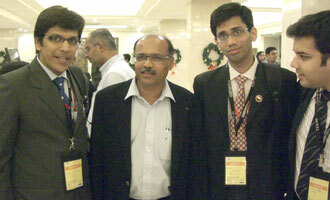 Organised by the Bangalore chapter, this was the third TiE Summit after Mumbai and Delhi. Apart from the ocean of knowledge and experience that was shared by these eminent personalities, the summit also provided our budding entrepreneurs with a platform for networking with these tycoons and other TiE & NEN members. All the students came back with a wider perspective about entrepreneurship and its intricacies as a whole. TES 2008 was a indeed power packed event. It was one of the covetous opportunities to network with top notch professionals whose life and business sense will continue to inspire the METizens.